Born to an aristocratic family living in Roccasecca, Italy, Thomas Aquinas joined the Dominican order while studying philosophy and theology at Naples. Later he pursued additional studies in Paris and Köln, where he was exposed to Aristotelean thought by Albert the Great and William of Moerbeke. During the rest of his life, he taught at Paris and Rome, writing millions of words on philosophical and theological issues and earning his reputation among the scholastics as "the angelic doctor." Aquinas developed in massive detail a synthesis of Christianity and Aristotelian philosophy that became the official doctrine of Roman Catholic theology in 1879. De Ente et Essentia ( On Being and Essence ) includes a basic statement of Aquinas's metaphysical position. His literary activity stopped abruptly as the result of a religious experience a few months before his death. 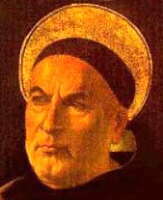 Although he wrote many commentaries on the works of Aristotle and a comprehensive Summa de Veritate Catholicae Fidei contra Gentiles ( Summa Contra Gentiles ) (1259-1264), Aquinas's unfinished Summa Theologica (1265-1273) represents the most complete statement of his philosophical system. The sections of greatest interest for survey courses include his views on the nature of god, including the five ways to prove god's existence, and his exposition of natural law. Although matters of such importance should be accepted on the basis of divine revelation alone, Aquinas held, it is at least possible (and perhaps even desirable) in some circumstances to achieve genuine knowledge of them by means of the rigorous application of human reason. As embodied souls (hylomorphic composites), human beings naturally rely on sensory information for their knowledge of the world. Reading hint: Although the rigidly formal structure of the Summa articles can be rather confusing to a modern reader, the central portion beginning with the words, " I answer that ..." is always a direct statement of Aquinas's own position. Daniel J. Kennedy's *extremely thorough treatment of Aquinas and treatise on his relation to medieval thought at The Jacques Maritain Center. The Condemnation of 1277 by Hans Thijssen. An article in The Internet Encyclopedia of Philosophy.